The certification of document translations is duly issued in my capacity as a German public and sworn translator for English, German and Spanish. Through the certification the authorized translator confirms the accuracy and completeness of the translation in relation to the original document. 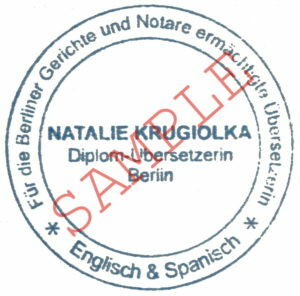 The certification note, stamp and signature of the official translator turn the translation into an official document which is recognized in Germany and abroad. When is the certification of the translation required? Certified translations are usually required for all kinds of document translations and official purposes. Accordingly, certifications are commonplace for civil and academic documents such as birth certificates, marriage certificates, diplomas and transcripts of records, etc. However, the requisites for certified document translations may vary depending on the public agency addressed. It’s therefore worth inquiring about the necessity of the certification at the corresponding authority. The validity of certified translations in Germany is regulated by Article 142 of the German Civil Procedure Rules (ZPO), Presentation of Documents Order of 30 October 2008. Correspondingly, the recognition of certified translations does not depend on the Federal State where the translation is issued. This means, for example, that a certified translation which was elaborated in Berlin can rightfully be used in any German Federal State.